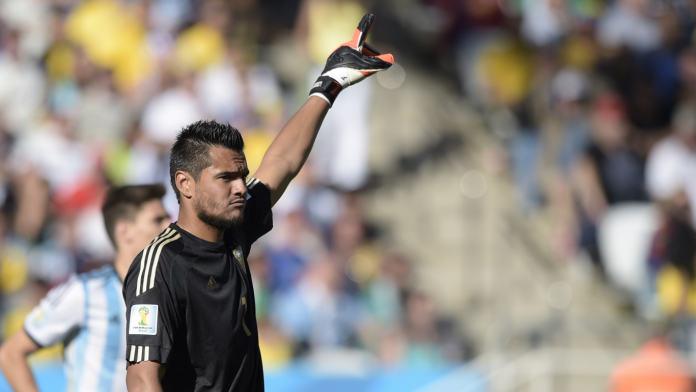 Sergio Romero playing for the Argentina National Team vs. Switzerland at the 2014 FIFA World Cup. We are just 50 days until the start of the FIFA World Cup and we will be counting down the Argentina moments, beginning with Sergio ROMERO! Argentina’s starting goalkeeper for the past two FIFA World Cup’s has played a total of 93 matches for his country but match number 50 for him was very special. It came on July 1, 2014 at the FIFA World Cup where Argentina defeated Switzerland 1-0 in extra time courtesy of a goal from Angel DI MARIA. A tight affair, Alejandro SABELLA’s men had much of the ball but were unable to do anything up until Rodrigo PALACIO won the ball, passed it to MESSI who went on a mazy run who then slotted it over to DI MARIA to score the winner. The entire bench went out to celebrate with the rest of the players as the team held on for the 1-0 win on their way to the final. It was a special World Cup not only for the fans but more specifically for the players. In this case, Sergio ROMERO. Chiquito ROMERO was under fire and seen as the weak link by much of the Argentina fan base but he proved his doubters wrong coming up with key moments for his country in the tournament. A few excellent saves in the opening match against Bosnia and Herzegovina was followed by an even better performance against Iran in the second group stage match. His stand out performance no doubt came in the semi-finals against the Netherlands where ROMERO made two saves in the penalty shootout as the Albiceleste defeated the Netherlands to reach the final in Rio. No doubt an unforgettable moment from all Argentina fans around the world and match number 50 for ROMERO against Switzerland will not be one easily forgotten. Tune in tomorrow for Argentina moment number 49! Forget Heguin and icardi..we can go with …..
God Help this team. Just 50 days left and still we have to bear with this type of Circus. I am not in agreement with the report. However this type of reports only come out when there is an atmosphere of disbelief/confusion within. True or false the whole saga of AFA and the national team is a circus currently. As a long suffering fan of Argentina this sort of reports doesn’t really helps 50 days before a Major Tournament. Besides, my support for blue and white will always be there as it is for last 25 years. Icardi was interviewed by argentina journalist, and one of the questions he was asked was this. 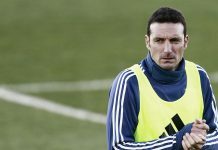 It seemed like many of the senior figures in the squad wanted Higuain back and so it was. How do you feel about that? Is it natural because of the relationships between those players? icardi was diplomatic in his answer but this reveals the reason failures like higuain and di maria etc are in the team. If you think this confirms anything you need some education in media. This is a leading question to make people like you think a rumor is real and generate buzz around it. It’s the equivalent of me asking you ‘since you’ve quit being an alcoholic how are you enjoying life?’. Any answer to deny you had a drinking problem effectively confirms the rumor, a diplomatic answer continues to leave the rumor open. Either way the journalist wins and people talk about their story, like you just did. Messi’s friends rumor is used constantly by media and the ask leading questionswith it. It’s not true!! Read the interview and icardi answers about the existance of the so called group. Media’s survival depends on over cooked fabrications that can easily be swallowed by Mafflards also fiberrtigibbets who could only take gossip than witnessing events or backing up their allegations with evidences. The “Begging to Quetion fallacy” or leading questions also presumptious, would easily be consumed and distributed by few irrational peoples or equally by peoples who have a hidden ulterior motives. Messi is a decent human being and am glad that he refused to dawn grade himself to the level that the Mefia dawns itself to make money. Let them talk as you are walking the talk in the pitch. Di Maria and Higuain failures? Never seems to amaze me. I wonder what Icardi have ever won in his playing career? Sorry, Icardi is champion at nothing, so what makes him a success and not Di Maria and Higuain? So are you trying to say Messi is a failure too? Di Maria have won more titles than what Icardi will ever accomplish in his entire playing career even if he play until he is 100 years old. Why take this guy serious, he was quiet for weeks after Icardi flopped against both Uruguay and Venezuela. Icardi has no skill, all he does is tapin hence the reason he couldn’t do anything in the qualifiers. guled and Gromoso: you are absolutely correct and that isn’t a new discovery, even retired Argentina legends figured this one out and called the NT friends club. Di Maria with his awful run and stupid passes has no business in the team. Aguero and Higuain: enough has been said about them. Biglia and mascherano belong to the museum. Rojo and banega belong to the 24 7 bar. Not sure Sampaoli will last after this world cup, and we all know what the next coach will bring: all players that are asked by both media and fans will join the team. I have more hope next world cup in Qatar after the mafia resign. Well friendship is bigger than WC then we have waited for 38 yrs we can wait for 4 more!! 50 days to go…to fast and to soon but at least we are not Italy and chile hahahahah as we are their at the w.c18 and that means we have a chance. We are talking about friends club. I have no idea what is right. But I think lavezzi is such a player who is loved by all. And he is very close to both messy and masche I. But right now he is nowhere near the national team. I think lavezzi has more influence on this team than biglia, but before the last friendlies biglia preferred higuain as main striker . Biglia has been playing for a long time, but I think we have better blockers than biglia in the form of battaglia and ascacibar. Biglia is not an inevitable part of this team, he won’t be missed if he remains unfit for the world cup, and he is far inferior to a player of fernandinho’s class, still he is claiming higuain to be our main striker, I am puzzled about what to believe.what you say guys? Guys there is report that Huigain gained more weight than last season and Juventus fans are very furious with Huigain. They are planning to sell him to lower level la liga team and will probably buy Icardi to help them in champion league. So do you still want Huigain in argentina team? Nope but considering Huigain nothing is impossible. Remember the famous Pizza and Coke assault by Napoli fans to Huigain. good. he thrives on being called fat. do it more.. Very well said,no LETHAL combination with Higuain,Di Maria ,Augreo not good at all. It wasnt so much the miss, he had back surgery, he lost his speed after it and was never the same. The miss pressure surely doesnt help his cause. He is still a good forward and should be on the bench, especially with Kun hurt. For me Icardi, Higuain and Lautauro should all be called. Drop kun, he was the best one but I doubt he will recover form in time. True. When it mattered the most, most of them were were injured. Di maria injured, Augero injured and Hugain is alway injured in big games. So only Messi left and Sabella f by putting augero instead of levazzi. Because they were 4 years younger. Sports and age are enemies. I like the current Barca system and Messi’s position in it, kind of right forward/9-half, slightly behind Suarez who plays in a the left forward position and supported by 4 midfielders. The 2 fullbacks help to provide solutions to Messi when it is saturated in the middle. Kind of 2-6-1-1 when Barca has the ball. His style is always straight forward and risk taking, it’s against his nature if he drops too deep. His impact will be limited as well if he plays as striker or right winger. Really 9-half is the best position for him. Pavon is the good fit in Suarez’s position. That need to be someone very active, right-footed cutting from the left, able to look for space and break the lines by dribble and swap position with Messi. Aguero can do the job too if he is fully recovered. For the fullbacks, I want to see Acuna-Bustos(with Tagliafico-Salvio as subs). They may not have Alba’s creativity but they have their own quality. Acuna and Bustos are both good in crossing, besides Acuna is an excellent in dribbling. When Busquets was injured, they used Rakitic-Paulinho in the middle and Iniesta and Coutinho on each side. Samp should inspire from that as we don’t know when Biglia can recover. Enzo Perez is similar to Paulinho in his playing style. I’d like Paredes for replacing Rakitic, Lo Celso in Iniesta’s role and Meza/Di Maria/Lanzini for replacing Coutinho. Paredes, Enzo and Lo Celso can defend decently, playing 3 CM can compensate the lack of DM. That will be a very balanced team which may give the best of Messi. Argentina is not going to win the world cup by trying to replicate Barcelona playing style and tactics. As far as things stand right now, there is nothing special or tactical in the way Barcelona is playing right now. Enough with the Argentina need to do whatever Barcelona is doing in order for Messi and the national team to be successful. Let’s see, three consecutive UCL quarterfinal exit for Barcelona in the last five season, this is not what Argentina need right now. Moreover, Barcelona season has much more to do with Messi form than anything else. 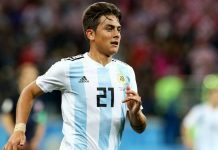 Sampaoli need to set up a ARGENTINA playing system that will be suitable for Messi and all the other 22 players instead of trying to copy and paste Barcelona current fail system. Did Barcelona win the 2017/2018 UCL with the ideas you are suggesting? Barca do not have midfield. Iniesta is 100 years old, Busquest is injured. Hence no creativity. Rakitic is not barca quality. Rakitic is so poor in quality that if you watch Barca match, he usually play behind busquets and hide there instead of creating any chances. In Roma match, Messi looked tired, hence Barca collapsed. Their coach is mid table coach who do not like to give chance to any one. I think Sampoali with this barca squad, would probaly win UCL but not this barca coach. I have never seen bad coach like him. Even Tata was decent and would never blow that lead against Roma. Tata was unfairly criticized by barca media whereas now they are licking Valverde’s a** even though we all know Messi solely won them La liga. 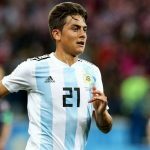 Kid and arg2018: For your information, it’s not only Barca playing in this way but also Spain and Real. It’s funny to talk with people who don’t really understand the tactics but only see if this or that player can dribble or do a pass or score. They just don’t understand the tactics is about placement. Actually this current Barca is worse than Argentina’s current squad to be honest. This Barca rely on Messi so much that even Argentina’s rely seems ordinary. They have Paulinho(i dont know why the bought him), Gomes and Denis Suarez in midfield. Luis Suarez is competing with Huigain in gaining more weight. Take Messi out of that team, Barca would no where win any trophies. I also think after the last contract with bumper 50 mil euros salary, Messi is trying to say F*** barca, i am taking my money home and you can buy 100 paulinho, i dont give a flying f***. If Sampoali provide decent platform for Messi to play, I see Argentina challenging any team except Brazil because Brazil will attack regardless of us having Messi. I feel tired to read people writing things of their imaginary life, here we talk about football. 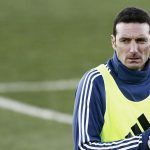 we all see how good barca formation works agianst chelsea and roma.you cant win by this tactics .in chelsea game they got lucky and messi played allright.but eventually teams will figure out and will dominate you.argentina should have their own strategy and club and international football is different anyways. Sampaoli has called up 104 players in the last 10 months. Everyone is coming up with their own teams and theories on Messi and friends. Folks who talk about Messi picking the team, yes he wanted 104 players in the last 10 odd matches. – Lack of midfield talent and not Higuain/Dybala/Icardi – Any progress in mdifield from 2014 – None. The only person that folks blame here is Higuain. Yes he missed 3 chances, but how many were created from good play from midfield. Everyone felt Dybala and Icardi will solve the issues. Did it happen – NO. When you do not have good attacking midfield options, no matter who you play upfront, the result will be the same. I consider Batistuta as the best striker Argentina has produced and in 2002 you know what happened in the world cup. Midfield did not create any chances. We scored 2 goals, one from a corner kick and the second from Crespo through a scrappy play. Any striker selected with the current midfield will be under immense stress because we lack wide options and a good midfielder who can transition from Defense to attack. Honest advice to Sampoali, Build team around Messi and makes him the focal point of attack; playing in closer to goal. No more dropping deep, building the play etc. Messi is still the most efficient striker in the world and we should utilize that trait of his. No more Huigain, Augero or others to lead the attack.